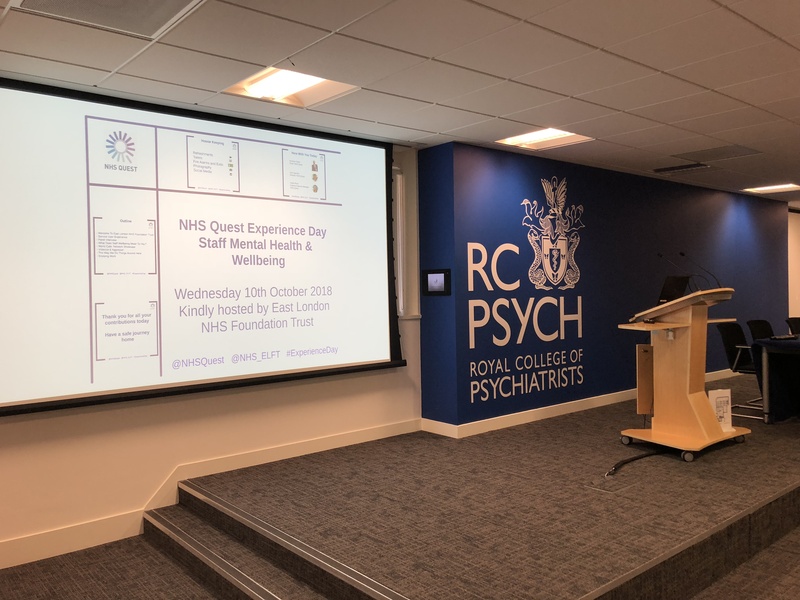 Welcome to the live blog for the Staff Mental Health and Wellbeing Experience Day hosted by East London NHS Foundation Trust, held on Wednesday 10th October at the Royal College of Psychiatrists. We begin the day with NHS Quest Director, Zoe Egerickx giving attendees an overview of what NHS Quest is and what they do. Donna Willis, from our hosts East London NHS Foundation Trust, welcomes attendees to the day alongside Zoe. 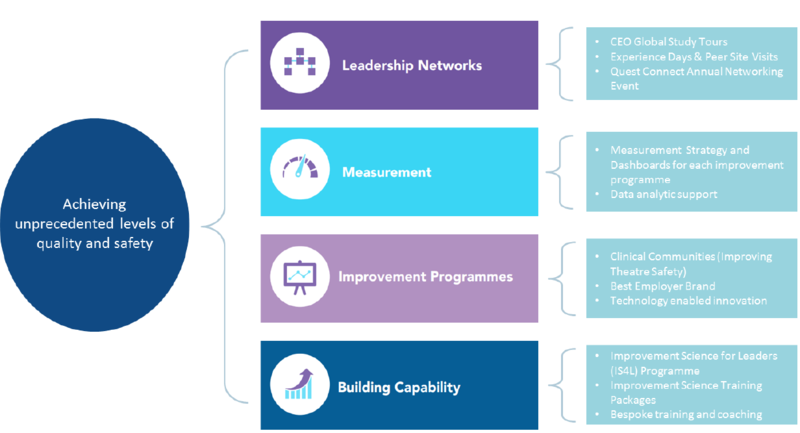 NHS Quest is the first member-convened network for NHS Trusts, who focus relentlessly on improving quality and safety. Zoe then hands over to attendees to each introduce themselves. We have over 8 member trusts represented here today. What does Staff Wellbeing mean to you? Zoe then hands over to Navina Evans, Chief Executive at East London NHS Foundation Trust. This is our opportunity to do something really innovative together. Navina identifies that we have to do something radically different to improve what we’re doing. She admits that they don’t always do terribly well with their staff, it’s not always easy to look after one another. It’s important to all share our struggles to help improve. Patients, service users and careers are an invaluable asset to identify what more we can do, how we can be more kind and compassionate with one another. We are now thrilled to be joined by service user, Adrian to learn more about People Participation at East London NHS Foundation Trust. Over a period of 14 months, Adrian had 3 acute admissions to East London NHS Foundation Trust. Molding the ethos of the trust, Adrian has the opportunity to sit on interview panels. Nothing can beat someone with lived experience. Adrian has also been involved with different committees, which gives him the opportunity to learn so much. It has pushed him out of this comfort zone. The environment doesn’t judge you, you are not defined by your mental health condition. Q: How much of your week do you spend working in the trust? Q: Do you have stock questions that you ask at interviews? 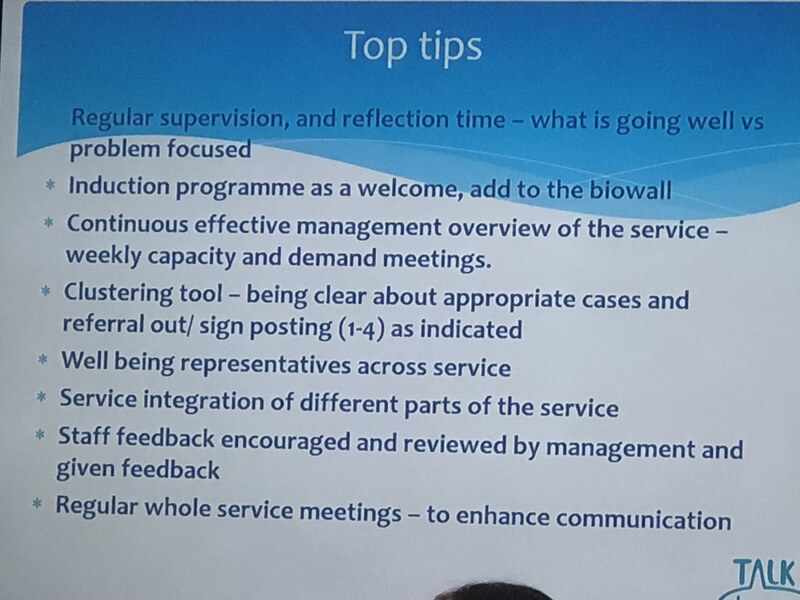 Adrian: yes, what do you think service users you’ve worked with would say is an area of improvement for you? And the best answer tends to be when they stop and think for a couple of minutes. Q: What could we do better to prepare committees/groups to get the most out of service users? Donna: we are constantly looking at how we can improve what we’re doing, asking what else we can do. Q: Is there more work to be done around ensuring People Participation is accessible to more users? Adrian: the trust is 100% committed to finding new ways for service users to share their voice and opinions. Donna reiterates the statistics that roughly 1.5 million people are employed in the NHS, and 1 in 4 people experience mental health problems each year. It doesn’t take much to realise that many NHS staff might have mental health issues throughout their life. It’s important to keep pushing through, and reaching out to service users and patients. Our next session is a panel interview with Marie Gabriel CBE, Chair and Navina Evans, Chief Executive. Marie begins by explaining that staff wellbeing is an expression of the staff values we hold dear. Staff are able to do their jobs well, and to help each other to be healthy. It is about caring. It’s also about our ambition for the organisation. Most of our workforce live within the area that we serve. So, by supporting our staff wellbeing, we’re supporting the wellbeing of the wider community. Navina follows by explaining that the Quest family are all about improvement and methodology. When ELFT shifted into using improvement methodology to solve our problems, it allowed us to see what wasn’t working. It gave us the opportunity to look at change ideas that might work, always allowing for failure going forward. Marie notes it’s so important to have honest conversations. Patient lived experience is also crucial. Mental health is often stigmatised, and what we have to recognise is as part of an organisation, we are part of that stigmatisation. The ELFT board is particularly focused on staff wellbeing, it is a consistent and persistent focus. It’s also so important to try and understand the root causes. Staff aren’t always comfortable with talking to their managers, so finding other ways for them to express themselves is vital. Donna opens the room up to questions and begins with asking how many people have staff wellbeing as one of their objectives? Q: how do we break down the stigma around mental health? Navina: being open about the conversations, actions speak louder than words. If we have examples to show that can be so useful. Our staff networks are critical, we have to lead by example. Marie: being open about our desire to recruit people with lived experience, to show that we are actively looking to get those people involved. Q: how do you hold yourselves to account as being an organisation that values staff wellbeing? Marie: we have a duty to protect our staff from what isn’t relevant. We trust our staff to be able to identify when they need more resource on their ward, and so we share that responsibility. We’re trying to relive some of the pressure from targets for our frontline staff. Marie finishes by explaining that when you’re doing quality improvement, look out for talent. Harness their energy, experience and enthusiasm to really make a difference to your organisation. In the final part of this session, each table is asked to consider what they do to handle staff wellbeing. We finish by watching videos from members of ELFT to look at what does the Mental Health of our staff mean to you? This afternoon begins with the world cafe where we hear from 3 of our NHS Quest member trusts. 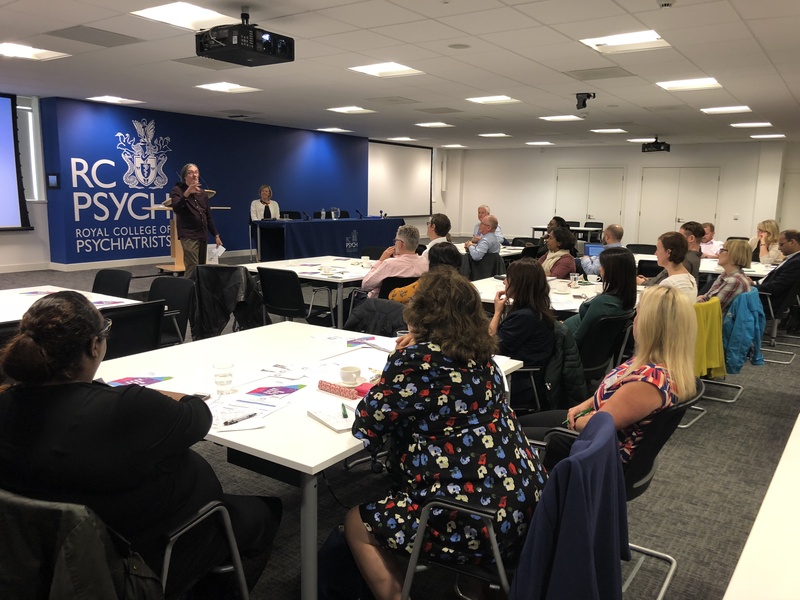 Nicole Ferguson, Occupational Psychologist & Deputy Director of Organisational Development at Wrightington, Wigan and Leigh NHS Foundation Trust is leading one of our sessions. Nicole begins by putting it into context. They are an acute hospital trust with 5000 staff, a high proportion of sickness due to anxiety/stress/mental health. Their Occupational Health service tended to focus on the more traditional issues. Steps 4 Wellness was launched to try and offer a more proactive approach. There was a trigger point which showed a gap in supporting staff during trauma. There was a requirement for a specialised trauma debrief programme. Wrightington, Wigan and Leigh trusted Critical Incident Stress Management (CISM) as an evidence based intervention approach, but they wanted to know more. We can’t always stop critical incidents, but we can change how we manage the impact! When setting up their CISM system, 15 staff were trained internally, offering them CPD sessions every 6 months. It was crucial to embed the service through raising awareness in communications. It was also important to embed it in other relevant programmes. Governance is vital to the system to ensure rota’s, triage process, monitoring, follow ups, and reporting is being used in the correct way. Jackie Stephen from Barnet, Enfield and Haringey runs our second session looking at some of the fantastic wellbeing work that has been done at their trust. Part of BEH’s key values is to help people to live, love, do through excellent care, happy staff and VFM services. Quality Improvement at BEH focuses on awareness, impact and co-ordination. The QI function is very well supported. From working with Haelo, faculty, improvement alumni and clinical fellows, everyone works together. The collaborative teams at BEH work across a range of sites, departments and projects. Jackie takes us through just one of the projects; staff specific example- morale raising. They worked to increase staff morale by 50%. It was great to see the improvement over time through their data. A second project was to reduce violence and aggression rates by 20% on Suffolk Ward. In actual fact the project reduced violence and aggression rates by 80% which should fantastic improvement for service users and staff. Jackie shows us the great work that has been done so far including the commitment to Healthy Workplace Charter, signing up to Mindful Employer, introduced supportive attendance policy, subsidised mindfulness app to staff, walking 1:1s and putting on a ‘Let’s talk about…’ event. Our third session is Wellbeing in City and Hackney, from Homerton University Hospital NHS Foundation Trust. City & Hackney IAPT was established in 2008, currently with approximately 60 staff members. In October 2017, they rebranded to become Talk Changes. Talk Changes with wellbeing in City and Hackney wanted to formalise a focus on staff wellbeing. They started with a brief staff wellbeing survey and then started to put staff ideas forward (mindfulness staff drop ins, coffee machine, and building on initiatives that had already commenced. The team note how important it is to ensure the systemic operation is working as it should, before encouraging wellbeing initiatives. There should be a continued focus on getting the basics right. Andrew Foster, Chair of NHS Quest is up next. He reiterates the period of austerity we’re living in. Staff become demoralised due to the stresses placed on them. This should inspire us to do everything we can to increase staff morale. To engage with them, and provide support. Up next we have Andy Cruickshank, Director of Nursing, and Day Njovona, Associate Clinical Director of Strategy and Security at East London NHS Foundation Trust are talking about violence reductions. At the beginning of their quality improvement journey, Andy begins by explaining how introducing huddles to their process, decreased violence by 80%. Andy explains how this developed into the Violence Reduction Collaborative, ensuring that this work could be spread. Violence can so easily be normalised, so it became important to change how people viewed what was happening. Shifting from being reactive, to proactive. Next Andy hands over to Day Njovona to discuss the changing perceptions of violence in forensic services. Day explains how the started by defining what violence actually meant, looking what behaviour had been normalised. Our next session is led by Stephen Sandford, the Professional Lead for Allied Health Professionals at East London NHS Foundation Trust. Stephen is here to talk about creativity in ELFT, and starts by showing us a fantastic video. ELFT have a long history of providing arts based interventions, which over time has been developed to support staff. It’s important to look and listen to what is important to staff, there is not a one-size fits all approach for wellbeing. The arts act as a bridge for learning development. ELFT use the Tate Modern for some of their training, to try and encourage different conversations. Stephen sets up a quick exercise for the group, create poem all about dreams by writing 1 line each. 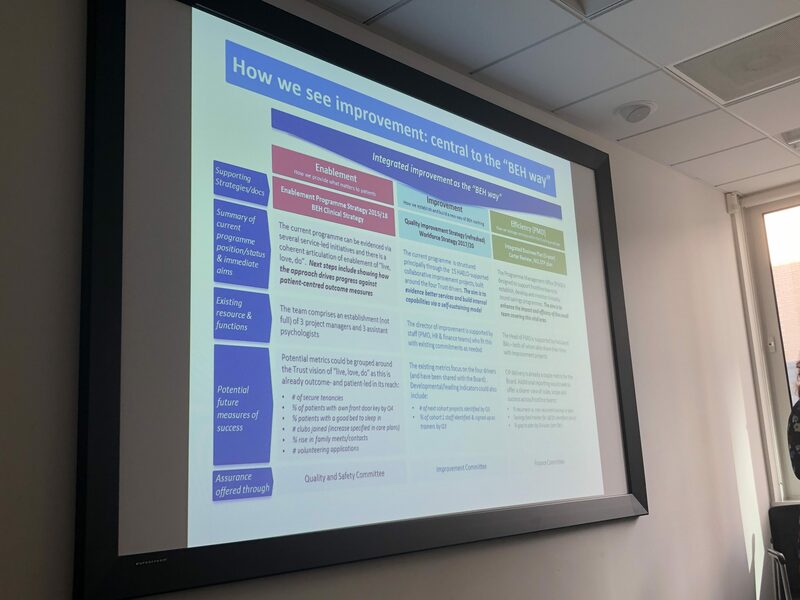 Our final session of the afternoon is led by Deeksha Mehta, QI Improvement Lead and Duncan Gilbert, Head of Quality Assurance, from East London NHS Foundation Trust to talk about the Enjoying Work QI project. It was decided that they needed a new structure to support a programme of improvement. ELFT’s Enjoying Work Collaborative was developed to aide this. What does enjoying work mean to you? After a great day Zoe wraps up what has been a rich, diverse and informative day.